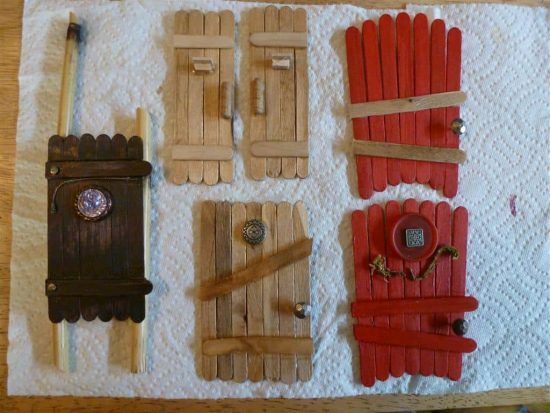 Learn how to make adorable Popsicle Stick Fairy Doors quickly and easily. They couldn’t be cuter and you are guaranteed to love the results. Be sure to watch the video too. You’re bound to find fairies around your home as well as at the bottom of your garden with these super cute Popsicle Stick Fairy Doors. They’re easy project ou can make in no time. There are so many cute examples we have included. You can use all sorts of leftover bits and pieces that are hanging around your house. They’ll make a lovely gift for family or friends too and you will be able to use them in so many different craft projects. You could also use one of the door ideas above and below for a fun Tooth Fairy Door in the bedroom next time she visits. Paint them up in cute colors to draw the eye and add to the excitement. As you can see by this cute pic from Roots Nursery, there are a number of easy ways that you can alter the appearance. We love the one on the bottom right that has a circular window. We know you will have a few ideas that you will be keen to try. You’ll love this fun video tutorial from Dreamworks TV. 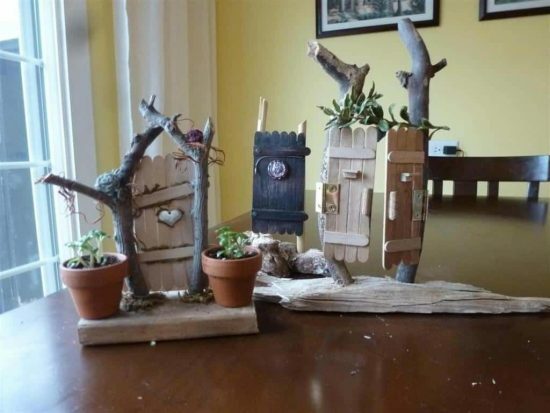 It includes a Popsicle Stick Fairy Door, a cute Fairy Table plus Chairs made using a bottle cap and twigs. It also shows a Fairy House. All you need to do for any of these projects is to lay out your Popsicle Sticks in the design you want. 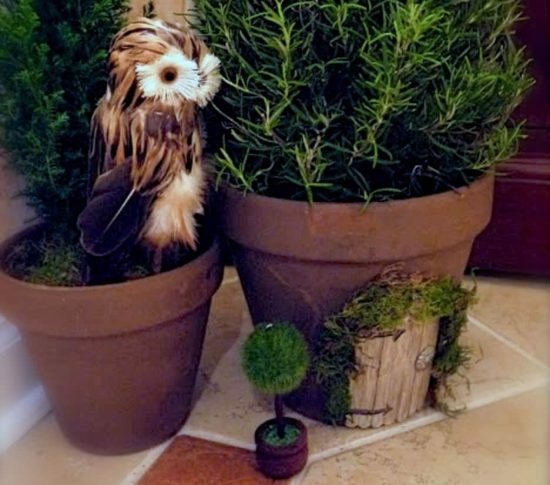 You can glue the sticks and decorate with buttons, moss, twine or bits of old jewelry. We love this adorable Fairy House from Hative and the popsicle sticks make the perfect Shingle Roof. 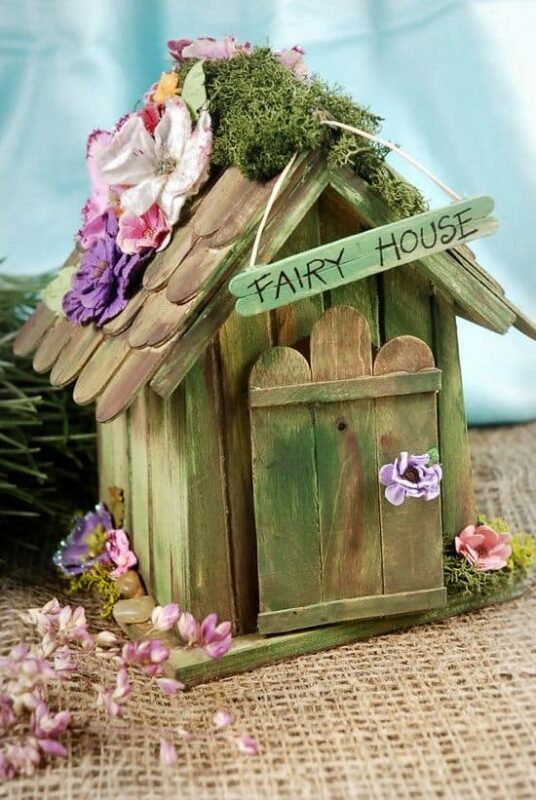 You can even add a name for your fairy house like the one above. Some silk or dried flowers also add a touch of whimsy. 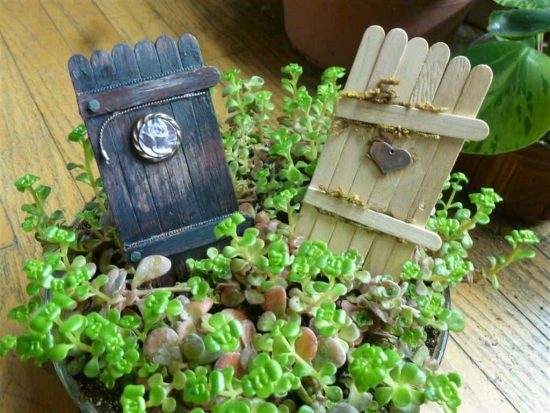 Over on Our Peaceful Planet they have made their popsicle stick fairy doors stand alone on a base. This is super easy to recreate and don’t they look wonderful. You can stain up your base or keep it natural, the choice is yours. You can also paint it in a favorite color. 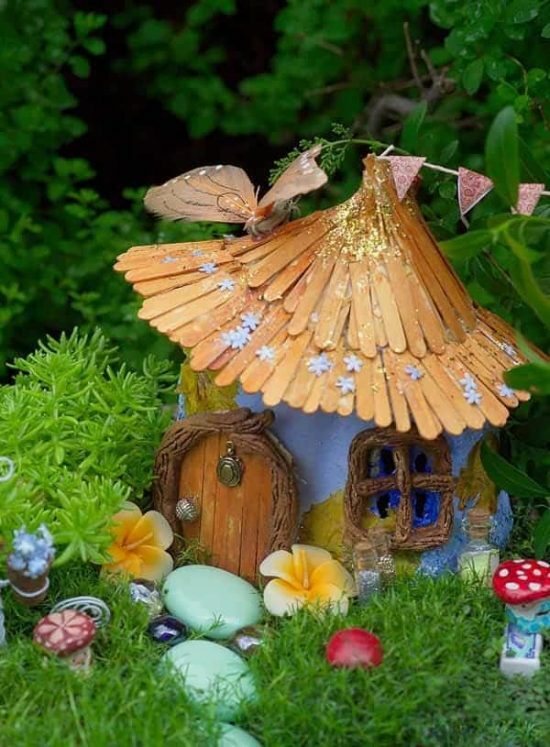 Over on Magic Onions which is a very sweet website, they have this version of the Fairy House and it has a two tiered Popsicle Roof and of course the button cute fairy door. This would look wonderful in a pot or fairy garden. We’ve found another cute Popsicle Stick Fairy Door that would be good for a Halloween decoration too. The tiny broom is a piece of wooden twig and raffia fastened together by copper wire. We love this sweet idea from Ana the mum Blogspot. Penny Wise has added their popsicle stick fairy door to a clay pot. This is so easy to do and will be a real talking point in your home. Here’s another great way to use your popsicle sticks. We love this Horseshoe Popsicle Stick Fairy Door that we found on Our Fairfield Home and Garden Site. 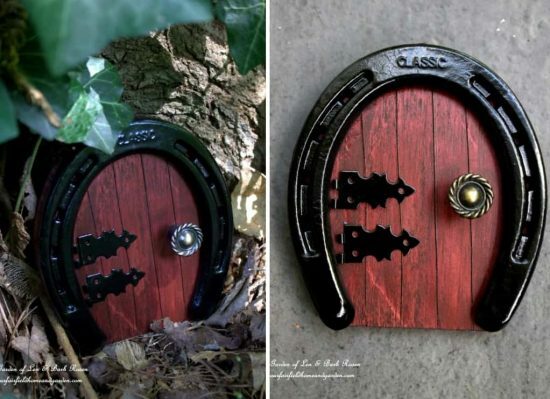 Isn’t this one of the cutest Fairy Doors you’ve seen? 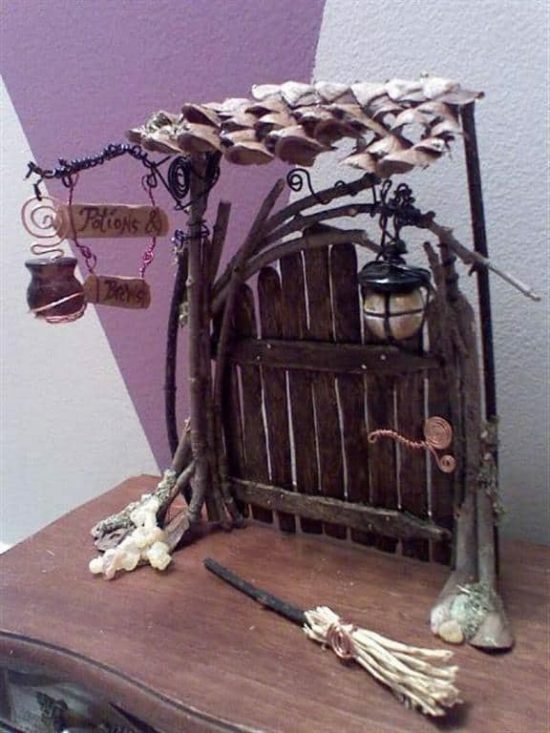 The Fairy Door is shaped using White Sculpey Clay and a Rolling Pin. It includes a Fairy Ladder made from Popsicle Sticks. This is another great example from The Magic Onions. Here’s a way to use your Popsicle Stick Door. This Popsicle Stick House is very easy to make and it looks great. The whole family will love to try this craft from such pretty things. Another adorable idea we found in our travels is this Popsicle Stick Fairy Bench idea. We are sure you have just the perfect spot to pop one. You can find more details on Meatloaf and Melodrama.